A trucking company regularly washed tanker units to eliminate cross contamination of various liquid products being transported. The mixed waste wash water (vegetable oil and petroleum hydrocarbons) was stored in a metal storage tank prior to discharge into the municipal wastewater system. BioWorld Liquid Optimizer, Hydrocarbon Digesting Microbes and General Blend Microbes were added several times to treat the mixed waste. 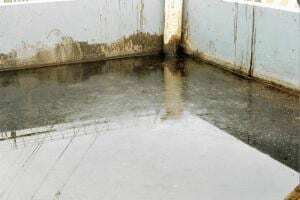 Note sides of tank – cleaned of sludge after treatment of BioWorld Products. Digestion of the mixed waste was visually apparent and a reduction in TPH and Oil/Grease concentrations was verified. The company saved substantially on wastewater discharge fees.